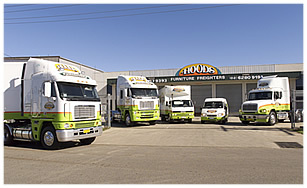 Hoods Furniture Freighters can offer you, the supplier, manufacturer, a complete furniture transport service package into Melbourne - Wagga - Canberra. Because Hoods Furniture Freighters are the only dedicated Canberra Wagga Melbourne furniture freighters in Australia we can move your furniture better than anyone else in this region. Company owners (Kerry and David Hood) operate the business themselves and are always only a phone call away. Packing: We specialise in secure and safe packing to save you time and trouble - our pre-packing team will come and pack for you. We pay special attention to your treasured items, antiques, and artworks, etc. If you wish to do your own packing, we can provide you with helpful hints and provide specialised packing materials. Clothes: We are able to provide special Porta-Robes for careful packing of your clothes so that they arrive ready to wear. Storage: Ask our consultant about how your belongings can be well protected and placed in storage for as long as you like. In Transit: We are in contact at all times with our on-road vans so that you have the convenience of being sure of the time of arrival of your possessions. Insurance: Our consultant will discuss and advise insurance options. Phone us now for a FREE quotation from our qualified consultant who will come to your home and help you plan your move. She can discuss all the details to make your move as trouble free as possible. Copyright © Hoods Furniture Freighters. Web design by The LAD Melbourne. All rights reserved.